One smoked trout and two meals for two. A hot smoked trout is a lovely treasure to store in the fridge for summer days. It landed there before Christmas and I am rather pleased it wasn’t required for a Christmas smoked trout pate. Now I can enjoy its pink, smoky flesh slowly over a couple of meals. 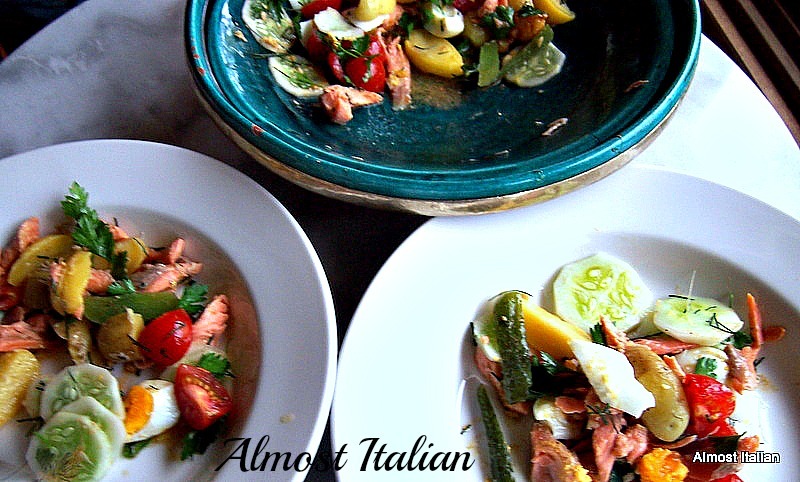 This hot day salad is a relative of Salad Nicoise. 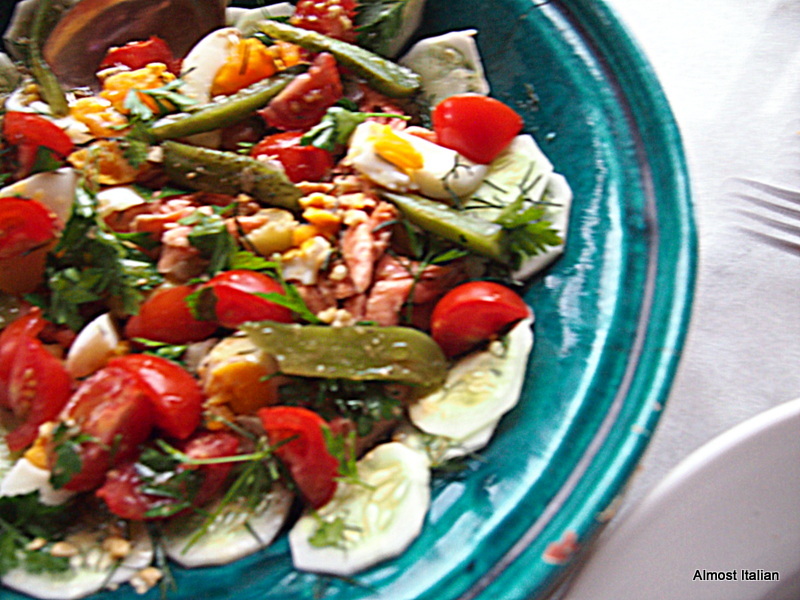 The ingredients are randomly chosen from the garden such as potato, beans, tomato, cucumber, dill and parsley with hard-boiled eggs and pickled gherkins added. You can add whatever is on hand. Add half the smoked trout, flaked and de-boned to the salad, making sure that you reserve the head, bones and skin, along with the rest of the trout, for the next use. Dress liberally with a garlic and hot mustard vinaigrette. 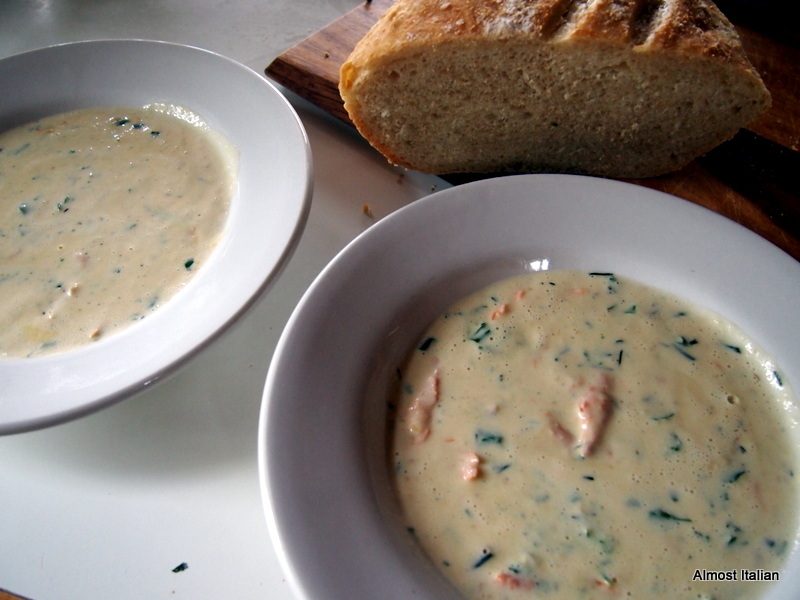 My next day soup, using the remaining trout and its carcass, is Cullen Skink, that famous chowder style soup from the coastal town of Cullen in Scotland. On a cool summer’s day when the rain softly drizzles, a little chowder is quite restorative. Ingredients, a list not measured! 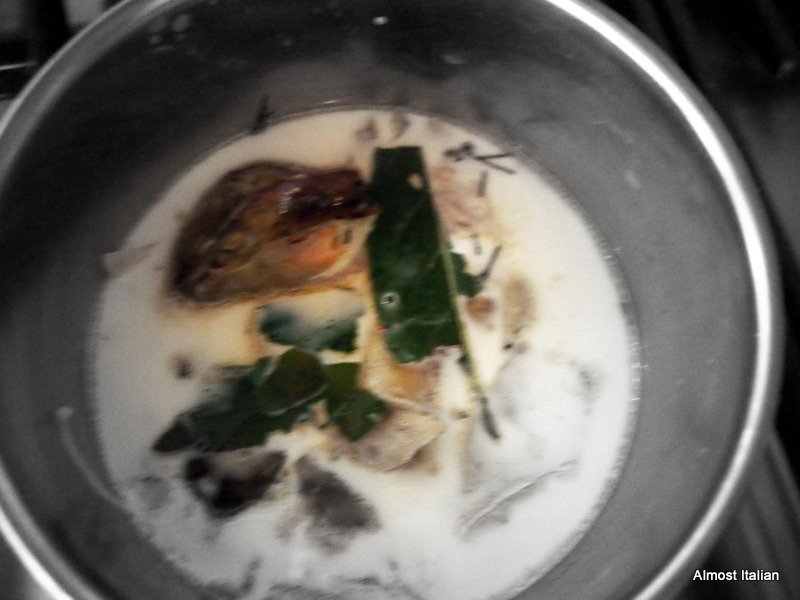 trout bones and head cooking in milk. Remove the bones, skin and head from the trout. Flake the fish, reserve. In a small pan, add the bones, head and skin, along with milk generously to cover and one bay leaf. Cook gently for five minutes or so, then cool. Cook the peeled potatoes, cut into chunks, in water until soft. Reserve water. Mash potatoes. Melt some butter in a heavy based pan and cook the chopped onion gently until golden. Using a mesh strainer, add all the strained milk from step one, to the onions. Press the solids in the strainer, to extract more flavour and add this. Discard solids. Add the mashed potato. Thin a little with potato cooking water. Add flaked trout, ground black pepper, chopped herbs and cream, tasting as you go, to obtain a good texture. It’s up to you how thin or rich your chowder becomes. 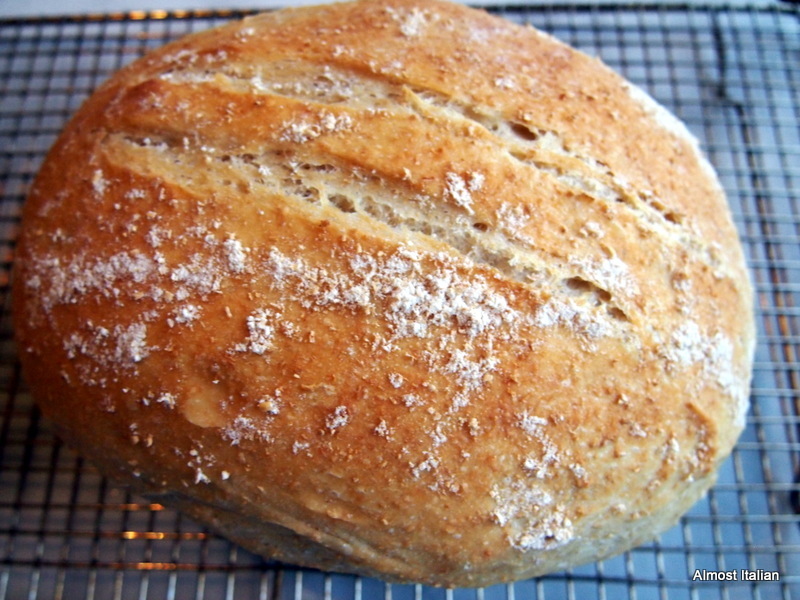 Serve with good bread. An Irish soda bread would be perfect. These two meals, using garden produce, costing the trout at $7.30, along with the cost of milk, cream, butter and some pantry bits, came to around $10.00. That is $2.50 per person per meal, for the salad and the soup, a little more than my $1.00 per meal goal. I have not factored in the cost of power, or the labour involved in growing our own vegetables. I thought I should add that little proviso, reminded gently by you in a previous post. We have been growing our own veg all our lives so the labour is now part of our makeup- even when we were both employed at the chalk face and busy with kids- the veggie garden was a part of our lives. So I have never really thought of it as a cost until yesterday, when we invested in more shade cloth, given that the summer sun is too brutal for soft salad leaves. The water comes from a vast dam, which is pumped to a header tank, then is gravity fed down to the garden, so there is a small monthly cost for fuel for the pump. The fencing, done by Mr T five years ago, to keep out the invaders, was also costly. But get me talking about the garden and I can’t stop….. The bowl is Turkish glazed terracotta with silver rim, and is a bit battered but I still love it. Trout is a prized local dish here, given the fast running streams. Your recipe would go very well! Ah, the vast running streams and rivers near the Serchio. I bet the trota is lovely on your part of the world. The turquoise bowl is a favourite, despite its little chips. Yum, yum. Full marks for using the trout “waste” to make Cullen Skink too. I love smoked trout but my pernickity other half always finds bones no matter how carefully I fillet it, so he’s reluctant! The credits on the side of the vegie growing ledger in terms of health fitness and nutrition far out weigh the monetary cost!! I’m wondering, Sandra, about the fitness issues, as my ability to shovel, bend, cart and dig is wavering. The nutritive value, taste and joy of home grown produce keeps me going. Part of this budgeting exercise is to demonstrate something to the much younger ones- that you can eat well enough for very little by growing some herbs or a few simple veggies in the back/front yard or porch/terrace. If I consider the cost of herbs alone, I would be up for another $10.00 a week, if purchased. That’s one return fare to somewhere in Asia for me. I absolutely agree about looking after those small $$$ so they turn into significant numbers. While I’m unable to grow veg, i do have herbs at my finger tips. I never ever discard anything edible. I’m about to make a delicious lunch of vegie fritters with all the tired ends languishing in the fridge. Careful storage for optimum life span is also a frugal keypoint. That looks seriously delicious. $2.50 per person – you’re such a profligate! Well done. I know- talk about lash out!!! I wonder why some of us have this switch turned on in our head? The option where looking the fridge/cupboards/backyard for meal ingredients occurs before buying new/takeaway/packaged, where it matters how much it costs not because we can’t afford me but we know where our money is spent and we derive pleasure and accomplishment from getting the best out of it in every way. Oooh a food experience with a house guest over Christmas- that’s the time for these annoying things to happen. I’ve heard of a few lately. Welcome home to the like minded. I love smoked trout but have never thought to make a chowder from the bones. Such a great idea! Ah, why waste the head and bones- lots of flavour there. Thanks Helen. Next Next post: Travel Theme: Mischievous in Melbourne.